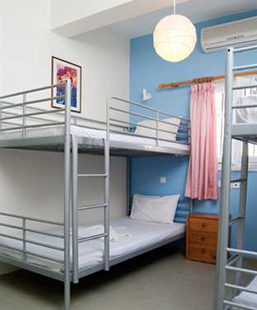 A1 Princess Sissy Ios Hotel & Hostel is situated upon a hill, in the middle of the old walking main road. With steps, that connect the port and the Chora (Ios village) and is just 300m away from the beach. 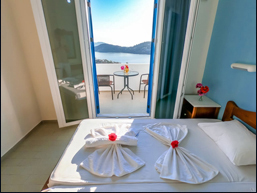 With reception you'll be able to have a room service and other facilities such as breakfast room, internet access, free wi-fi internet, free parking, bar, restaurant, safety deposit boxes, satellite TV, laundry/ironing service, free Ios island map, car rental, daily excursions to archaeological places and beaches. 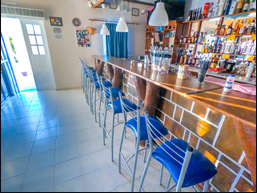 Also free transfer from the port to the hotel is available and we offer 10% discount on Restaurant and Bar fees for the Hotel customers. Call us with your boat details and our minibus will pick you up from the harbor without charge. 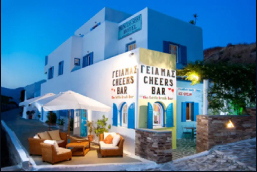 A1 Princess Sissy Ios Hotel & Hostel is 300m from Chora and 300m from the Port, or 5min walking from Chora and the Port. Also there is frequent bus service (Port - Chora - Mylopotas beach).